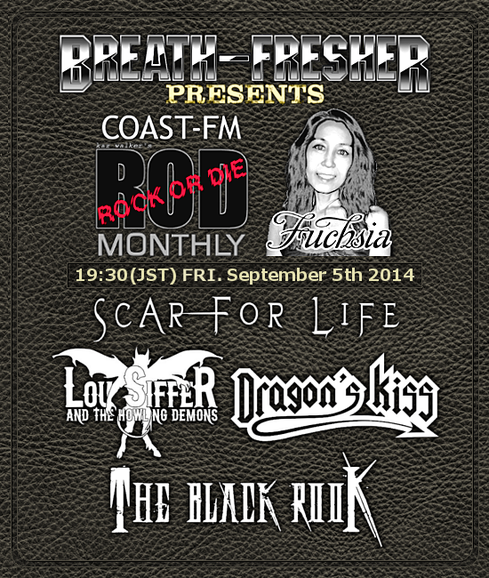 ROCK OR DIE Monthly #51 will be aired at 7:30 pm (GMT+9) on Friday, September 5th 2014. Following 4 bands will be featured on the show. After it was aired in Japan, it can be heard on podcast on our site. DRAGON'S KISS - Album "Barbarians Of The Wasteland"
LOU SIFFER AND THE HOWLING DEMONS - Album "At Your Service"
SCAR FOR LIFE - Album "Worlds Entwined"
THE BLACK ROOK - Album "The Black Rook"